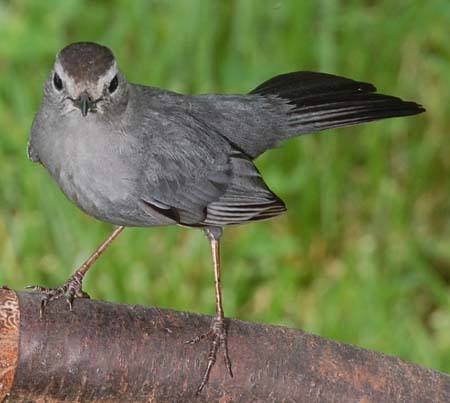 The gray catbird is, by far, the most numerous of the mimic thrushes on our property. 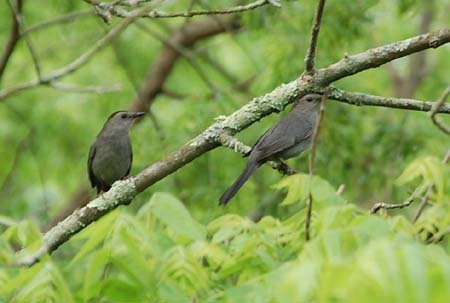 Catbirds only defend their immediate nesting territory, which allows continuous catbird territories throughout most of our trails. This results in a continual series of meowing and other unique catbird calls passing from one nesting pair to the next, alerting all creatures of my presence as I pass among them. So much for sneaking up on anything. 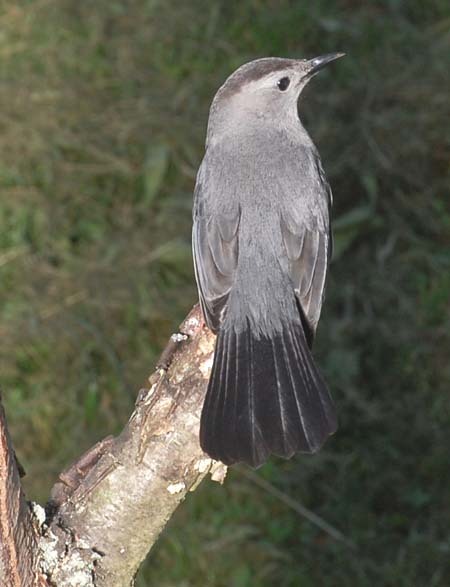 Gray catbirds usually nest in our smaller red cedars or in low thickets or shrubs, often along the creek. The bulky nests are usually well hidden. 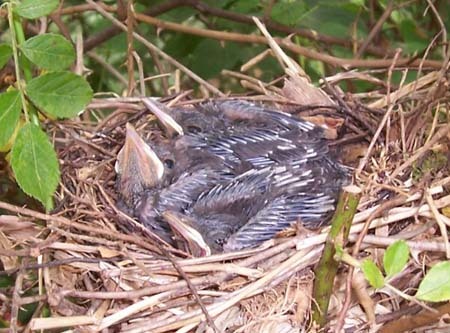 In 2006, the nest illustrated on this page was located within 12 feet of an active nest of the Eastern wood-pewee. Observing the pewees required hiding from the catbirds in a blind. 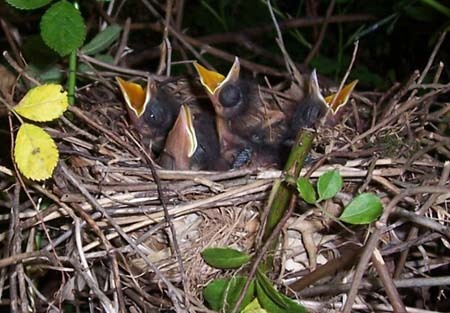 While a brown headed cowbird had laid an egg in the pewee nest, the catbird nest either was not parasitized or the catbird ejected the egg. 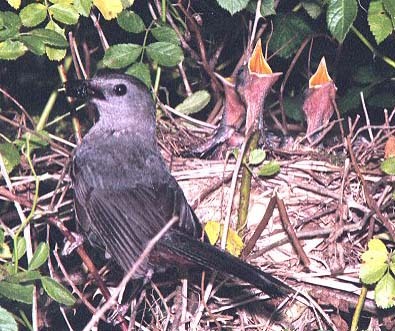 Many people claim that the gray catbird robs the nests of other songbirds. I don't dispute this, but have never witnessed such an action. In 2006, the pewees and catbirds didn't show the least interest in one another. 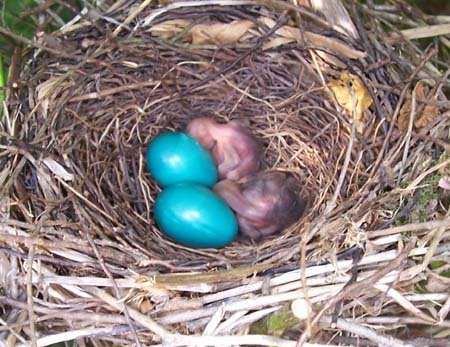 I've also observed the simultaneous nesting of a gray catbird and a robin in the same small red cedar tree. The nests were on opposite sides of the tree and the two species seemed to always approach from opposite directions. 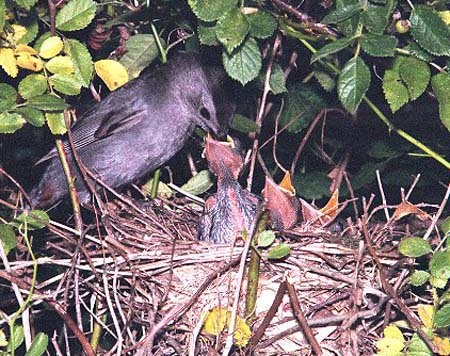 Gray catbirds consume a great deal of fruit and even feed mulberries and blackberries to their nestlings. Once, catbirds nested right in the middle of an elderberry patch, although that nesting wasn't synchronized with the ripening of the elderberries. &COPY; 2013, American Artifacts and Richard Van Vleck, Taneytown, Maryland.